September found Britain enjoying a glut of free food. The fruit in question was the blackberry. A combination of rain and sustained sunshine meant that the 2013 crop was particularly bountiful, with bushes laden with fat fruit. Even those who don't have a blackberry bush on their doorstep don't have to wander too far to find a crop. Disused railway tracks that have been converted into cycle-paths are particularly fruitful, as railway companies used to plant the prickly brambles to deter kids from wandering onto the tracks. Once you have your harvest, the obvious next step is to peel some apples and prepare a pie or crumble. This is a classic combination for good reason, but can be tweaked. Add a pinch of cinnamon or lemon zest or substitute pears for apples for a more sophisticated result. As a topping for cheesecake, blackberries offer a pleasing, tangy contrast to the richness of the cheese. Blackberry also combines well with almonds. There are countless recipes combining cherry and almonds, from Bakewell tarts to clafoutis. Substituting blackberries usually works well, and has the benefit of being much cheaper. Blackberry also serves as an excellent base for a tart sauce or jus to go with game or duck. Combined with a little all-spice or juniper it goes brilliantly with venison, but also works with slow-cooked beef or lamb. 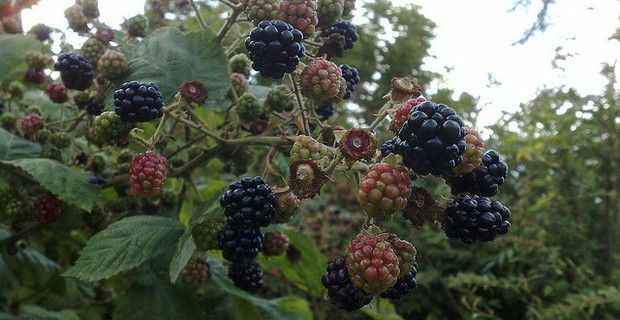 A blackberry jelly, using rather less sugar than jam, and strained to eliminate the seeds, works well as an accompaniment to cold meats, cheeses or veal and ham pies, or to enrich game stews. Blackberry can also rescue that cheap bottle of vodka or gin you picked up at the supermarket and regretted after the first sip. Combined in roughly equal quantities of spirit, sugar and fruit and left for a couple of months, the result will be a delicious, sweet and slightly spiced liqueur perfect for Christmas.